Minecraft creator Markus "Notch" Persson wants to get together with Tim Schafer and "make Psychonauts 2 happen." Released in 2005, Psychonauts was a stroke of sheer genius. It was also, despite widespread critical acclaim, a pretty huge bomb. Eight months after launch it had sold less than 100,000 copies and ultimately played a big part in driving Majesco out of the "premium console market." 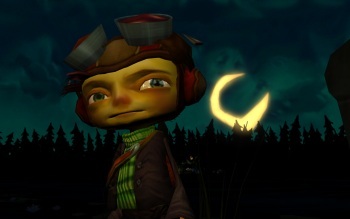 That's why a sequel, despite creator Tim Schafer's interest in making one, remains a far off dream. "I've actually pitched that to publishers several times and no-one has taken the bait so far," he said in a recent interview with Digital Spy. "I'd love to do that game, but I'd have to convince someone to just give me a few million dollars, that's all." But the dream may not be quite so far-off anymore, because someone has apparently been convinced. Following the interview, Notch, the man who made Minecraft, asked a simple question on Twitter: "How many millions exactly?" That, naturally, led to a joking response from Rock, Paper, Shotgun about an exclusive report of Notch's offer to fund the sequel, followed by confusion when he sent a more straightforward message to Schafer saying, "Let's make Psychonauts 2 happen." Is he serious? "I'm serious," he said in another tweet. It's a long way from a signed contract but the commitment appears to be there. The next step is up to Schafer, however. "Let's wait for Tim to respond," Notch wrote to enthusiastic hopefuls. "It's his baby." @TimOfLegend hasn't yet commented on the situation, although he does seem aware that something is going on. "Man, so many tweets. I assume this is all people asking for codes to Happy Action Theater and Rise of the Martian Bear?" he wrote. "Oh wait. Hm. This is interesting." UPDATE: How serious is he? Believe it or not, the wheels are already turning. "Tim and Markus are talking," a Double Fine rep told Eurogamer. "Who knows what might happen?"